New research: Just how common are Human Herpes Viruses? Some of you may have read about my previous research into the Herpes simplex virus and its possible involvement in Alzheimer’s disease. Further from this, my collaborators in Umeå Sweden and I recently had our latest paper published, so I thought I’d share our findings with you. It is important to know the incidence, or numbers of infected individuals, of any infection-causing agent (bacteria, viruses etc.) for the purpose of understanding whether certain behaviours or actions increase or decrease numbers, and how these infections can be prevented or treated. 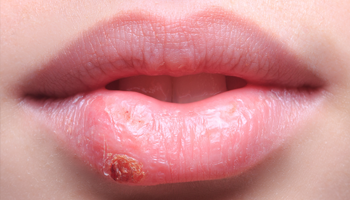 For viruses such as the Herpes simplex virus (HSV), which is relatively harmless, generally causing only blisters on the face, usually around the lips, this might seem rather unnecessary. But HSV can also cause genital herpes (usually HSV type 2, but not unheard of for type 1), be harmful to immune-compromised individuals such as the very young or old, and may sometimes result in a severe disease known as Herpesviral encephalitis, which can be fatal. Most surprising about this virus is that fairly often people may not even know they are infected, showing no symptoms at all, but still capable of passing on the disease. We chose to look at the group of Human Herpes Viruses (HHV) that follow a cycle of primary infection, then a latency period, which is interrupted by reactivation periods. This group of viruses include Herpes simplex viruses type 1 (cold sores) and 2 (genital herpes), Varicella zoster virus (VZV, which causes chicken pox), Cytomegalovirus (CMV), and Human herpesvirus 6 (HHV6, which causes sixth disease – named so because it is the sixth of a number of rash-causing diseases usually developing in childhood). It is not known what causes the reactivation of these diseases, although certain immune system stressors can cause these. I myself had a reactivated case of Varicella (Shingles) during pregnancy with my second child. So what did we find? If you read the results section of the abstract, you’ll find we found the following: 79.4% had antibodies (proving infection had occurred at some time) against HSV1, 12.9% for HSV2, 97.9% for VZV, 83.2% against CMV, and 97.5% had antibodies against HHV6 in the studied population (which were Swedes from Umeå). This means that generally the results were in line with similar population studies around the world. There was a higher chance of women having had infections than men, and the occurrence of HSV has dropped compared to earlier, possibly by reduced risks of contracting the disease, through awareness or effective treatments reducing exposure of contaminated bodily fluids (think of all the cold sore drugs on the market nowadays). Whilst our paper doesn’t offer any radical new theories or propose new treatment methods or therapies, it is important to investigate and share this data of numbers of infected individuals of various diseases. Whether the Herpes simplex virus and Alzheimer’s disease connection is a real one is still under debate, however it is interesting to note that the incidence of both have been declining. The paper has been published as an open access article, which means you can download and read it for free (see the link above). Enjoy!